For over 50 years, our anesthesia professionals have been providing anesthesia and pain management services to patients throughout Pennsylvania. Our team of Anesthesiologists, Nurse Anesthetists, Physicians Assistants, and dedicated support staff has been recognized for not only high quality anesthesia services, but also the attention and care that goes into each patient’s perioperative experience. Our team of certified anesthesia professionals is highly qualified to provide state of the art anesthesia services, and a safe, comfortable and personalized surgical experience for each patient and their families. Associates in Anesthesia is pleased to be the exclusive provider of anesthesia services at several sites in the Crozer Keystone Health System. The Crozer Keystone facilities are well-recognized for their outstanding medical services, and we look forward to continuing our shared success and excellent patient care services. Associates in Anesthesia’s team of highly trained and certified Anesthesiologists, CRNA’s, Physician’s Assistants and RN’s provide compassionate, comprehensive services to Crozer Keystone and several other excellent facilities. Our professional organization supports each patient’s well-being by providing a superior pre-op experience that employs both clinical expertise and personalized care. 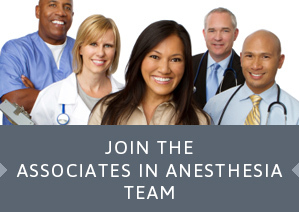 Are you interested in joining our Anesthesia team? We are always looking for qualified anesthesia professionals! We also provide anesthesia training and clinical experience to medical students, residents and nurse anesthesia students. Please submit resumes to the attention of john.christy@aiamd.com, Chief Operating Officer, Associates in Anesthesia, 30 Medical Center Boulevard, Professional Office Bldg1, Suite 305, Upland, PA 19013; Associates in Anesthesia, Inc. is an Equal Opportunity Employer. Associates in Anesthesia is an exclusive provider of anesthesia services at several sites in the Crozer Keystone Health System. Find out more about Crozer Keystone’s network of hospitals and comprehensive services. For more information on our anesthesia services or questions on anesthesia procedures for your upcoming surgery, contact us!